Adidas Deep Energy helps every man feel his inner energy and strength. 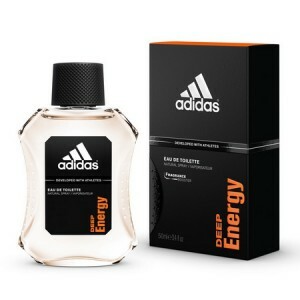 Adidas deep energy cologne 100ml. Eau De Toilette for Men by Adidas. Unique Fragrance Adidas Deep Energy helps every man feel his inner energy and strength. This perfume Deep Energy pleasantly refreshes you and gives you a taste of the game achievement. The man who wears Deep Energy fragrance is strong, courageous and charismatic. Head fragrance Adidas Deep Energy Dynamic opening chords of bergamot, sweet and juicy mandarin. The heart consists of the essence of being torn captivating apples and cardamom. An interesting period at the end creates a sensual musk and precious woody notes. This exclusive and unique men's fragrance Adidas will be the perfect companion for sport. Men's fragrance Adidas Deep Energy is for all men who love action, movement and sport. With this unique perfume achieve victory!